We all know of the movements of Occupy Wall Street and Occupy Minneapolis. 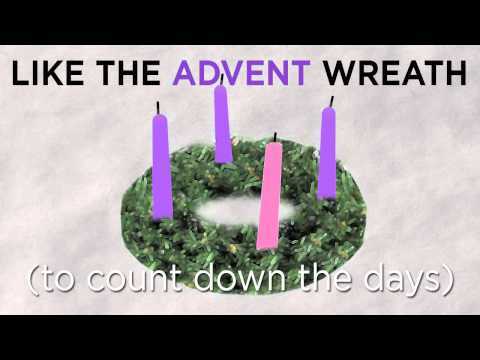 I propose another, decidedly Catholic, movement: Occupy Advent! As early as Halloween, I started seeing Christmas ads on TV and hearing Christmas music in stores and on the radio. I am no Scrooge – I love Christmas as much as the next person but I don’t think that holding Christmas in our hearts all year means to fall away to the commercialism of the secular season! By missing this most important time of the liturgical year that calls us for preparation and waiting, we rush right into the Christmas season without the Christmas heart. The art and discipline of waiting is lost on our generation of “Give it to me now” attitudes. I am guilty myself when I find myself waiting more than 5 seconds for my computer to respond! A happening which gives me much fodder for the confessional. Which reminds me – celebrating the Sacrament of confession is another beautiful way to prepare during this season of waiting. Advent waiting is anything but somber – we are waiting, but we are waiting for Christ so it is always a joyful waiting. So put away the Red and Green and let the first greenery that you bring into the house be an Advent wreath (If you missed the first week – jump in now!). We need to bravely take back this time. I am not proposing to stand outside and hold a protest – rather hold off on putting up the tree, hold off on the Christmas carols, hold off on the parties and festivities… at least until Gaudette Sunday (That is the week that the priests wear the pink – I mean rose – colored garments. The term Gaudete refers to the word “Rejoice”. Rose vestments are worn to emphasize our joy that Christmas is near. Where as Advent as a whole is a bit penitential – by the time we get to the 3rd week – we can throw in a bit of rejoicing!) And when your neighbors ask why you haven’t lit up your outdoor lights yet – tell them you are participating in Occupy Advent. What are some of your favorite Advent traditions? Please share them with me! We need to band together in Occupy Advent! Maybe we should have T-Shirts made! ← New words at Mass: How did it go at your parish?